Cross Force from Spectravideo is a rare thing for the Atari 2600, it's a space ship shooter. "But Dusty Old Games," I hear you scream, "there's a million and one space ship shooters for the 2600! Pheonix, Demon Attack, Galaxian, Star Raiders! " Right you are reader, the 2600 certainly got it's fair share of space shooters. However, great though a lot of them are, most kept to the tried and tested formula. You are a ship at the bottom of the screen. 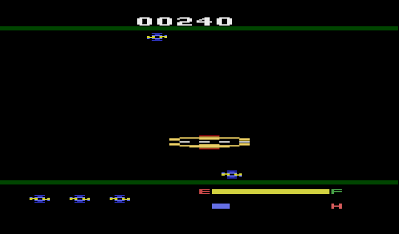 Enemies are at the top of the screen. Shoot them. If you were really lucky, games like Vanguard, Yar's Revenge or Stargate (Defender) would come along and flip that game style horizontally. Now I'm not complaining, that sort of game works. It gave us some fantastic games that have rightly earned their places on my shelves. What makes cross force different and interesting however is that you don't control one, but two gun/ship things, and what really gives me a developed case of brain wow is that you don't even have to shoot straight up! Your two guns straddle the space in which enemies appear, one at the top and one at the bottom. Pressing right on the joystick makes the lower gun move right, and the upper gun move left, and vice versa. When you fire, rather than a mere pellet shooting out, a huge throbbing vein (heh) of lightning joins your two guns, blasting anything out of it's way with that lovely 2600 zap sound we all know and love. If you're really lucky, all your enemies will line up diagonally (almost as if they want to die) and you can clear a whole screen of enemies with one delicious zap. If this all sounds too simple for you, think again. The large 'mothership' you can see in the picture above keeps coming past and dropping off various enemies, which in turn drop off bombs on to your guns, which are one hit kills. Also, note the E---F gauge and the H gauge. Your guns run on fuel, the more you move, the more you use. You then have to shoot flashing asterisks ( fuel containers, you have to use your imagination a bit with 2600 games) to refuel. However, the more you shoot, the closer to overheating (H) your guns get! Managing this is easy enough for the first little while of the game, but as more enemies come they will move faster, meaning you have to move faster. They will drop more bombs both up and down, meaning you have to move out of the way more often. There is less fuel available, meaning you have to manage movement more carefully. After playing for a while, like all the best Atari games, Cross Force becomes incredibly addictive. I had planned on playing for half an hour or so to freshen my memory prior to writing this review and accidentally ended up wasting half the afternoon away. Despite the fact that it is fairly hard to come by and only ever got a North American release (yet inexplicably works fine on my UK console) I think most 2600 collectors would really enjoy this title, and it is a valuable addition to anyone's collection if you can hunt it down.